Chipotle lost $26.4 million in the first quarter of 2016. It's the first quarterly loss the company has ever reported since it went public in 2006. During the same quarter last year, Chipotle reported a net income of $122.6 million. In a report released Tuesday, Chipotle (CMG) blamed the loss on lower same-store sales, which were hurt by fewer purchases as well as more promotional discount offers. 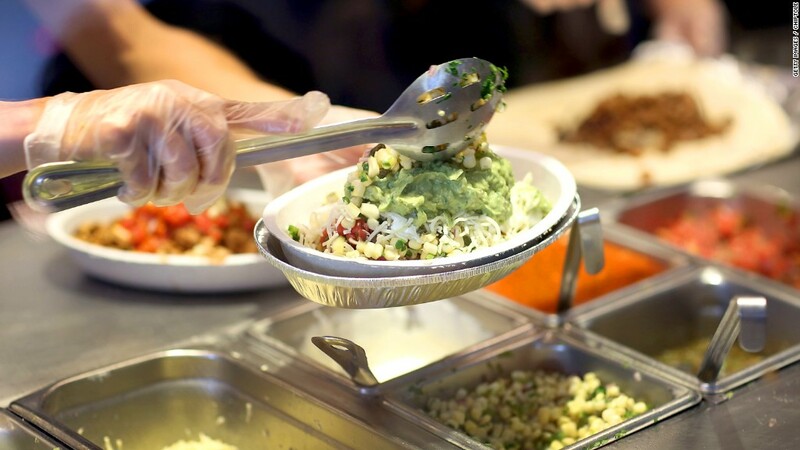 Chipotle said its same-store sales were down nearly 30% from last year. After numerous customers around the country were sickened by multiple outbreaks of foodborne illnesses, Chipotle launched a series of promotions and overhauled its food prep system to win back diners. The campaigns haven't been cheap. In February, Chipotle closed all of its stores for a four-hour meeting to discuss safety protocols and offered all of its customers one free entree. Since then, Chipotle has given away things like free guacamole and chips and offered $50 off catering. On Monday, it announced two new promotions -- a "buy one get one" free deal for teachers, faculty and school staff valid on May 3 and a free burrito for customers who buy $25 or more in gift cards before June 10. On a media call on Tuesday, co-CEO Steve Ells said Chipotle is confident its efforts are working. He said the promotional offers have shown signs that customers are coming for the deals and then returning as paying customers. "We are winning customers back," Ells said. Chipotle's troubles began in August 2015 when a Salmonella outbreak was linked to Chipotle stores in Minnesota. The chain was then plagued by four separate E. coli and norovirus outbreaks. The illnesses took a toll on the company's shares. Shares had hit an all-time high of $758 a share before the outbreaks. On Tuesday the stock was at $446, and slipped in after-hours trading.